I don’t know about you, but while my oldest enjoyed both reading and writing from a young age (and still do)....my other children do not! This often leads to conflict in the classroom, as I am inclined to read and write quite comfortably.....but my children don’t, and therefore I now need to educate myself in order to understand their perspective on, and challenge with writing especially – quite a challenge in itself, even if you enjoy it. The truth is that even if you are comfortable with expressing something in words, it does not mean you automatically write well. Writing is a skill that can be improved continuously, and maybe that is why it is so frustrating for children. At least in Mathematics once you ‘get it’, you get it, and in Maths things are either ‘right’ or ‘wrong’. 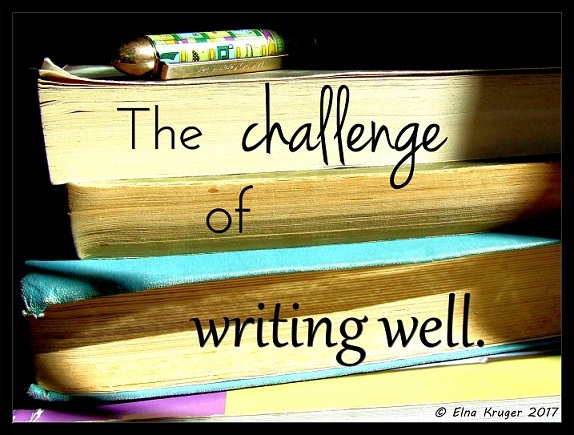 With writing there always seems to be a ‘not quite right’...and everybody who you may ask for feedback will give their ‘two cents worth’, so it is rather frustrating not knowing when to stop the editing and improving. Finding your unique ‘voice’ in expressing what you want to say is not that easy, since it depends on the feedback you get from whom. In our homeschooling situation this is even more difficult, since we as moms are not necessarily the best people to give feedback on writing styles. We can help with spelling and grammar and clarifying thoughts, but we don’t always know when a piece is well written...or not. Since I know that my challenge is not unique, I decided to dedicate this ezine to this topic – may we all find something to apply in the advice given below. ·	It helps if children understand they already have what it takes to write because they were born creative. ·	Sometimes children need the freedom to write without some higher purpose (including concerns about grammar and spelling) and have opportunities to create for their own pleasure and benefit alone. ·	“Creative people listen to and observe the world around them.” Real observation is a skill in itself which should be encouraged. This helps the writing process. ·	Just as there’s no right or wrong way to play, there is no right and wrong in writing, and if children can understand that they may relax more about it. ·	If kids know ahead of time that frustration is a natural part of the writing process, the experience can be less intimidating. What is it you are trying to say? How has it changed, for better or worse? What changes need to be made to bring this piece of writing in line with your vision for it? ·	When writing about a topic you need to research; writing is self-directed learning which can be quite exciting. “Writing is simply the process of transforming what we think into words. That process is the one reason kids need to write. Writing is a brain-building exercise. The real power in writing comes from struggling to find the words to express our thoughts. That is when the brain is churning—making connections, pondering questions, sorting and classifying details and experiences—all in an attempt to figure out what it is we have to say. So now you know why writing is hard work! But I agree with Debra in that we must teach our children to ‘think to write’. The ability to express yourself clearly is an important skill to have anywhere and in all relationships!